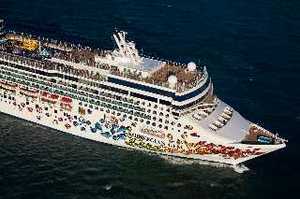 Norwegian Cruise Line likes to think of its big vacation ships as fish swimming outside traditional streams. Free spirits in a sea of sameness. Whatever you think is a traditional cruise, that's not what we are, says NCL. We are not old, we are not regimented, we are not sedentary, we are not boring. Say the TV commercials: "You are free to … whatever." The company line is that cruisers create their own vacations, free-style. That means that passengers may do what they want, free of structure and schedules, especially at meal time, which can be just about any time you want. I find that free spirit -- hip, loose, innovative and casual -- flowing through all NCL ships, though it's an evolving theme of freestyleness that works best on the newer vessels. 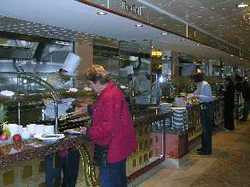 It has been fine tuned on the newest ship, the Norwegian Gem, which began cruising in December 2007. In summer, the ship has sailed out of Barcelona on Mediterranean voyages. For the winter and spring, the 2,400-passenger Norwegian Gem is based in New York, doing trips of 7 days, 10 days and 11 days, heading south to the Caribbean from January to mid-February, then to Florida and the Bahamas through mid-April. Prices start at about $100 per day per person for two people, for an inside cabin, and rise into the thousands for a top suite at 4,390 square feet, bigger than most houses. On my cruise, I found the Norwegian Gem a winner, clearly NCL's best and brightest ship. Gambling outside the casino, on the pool deck. 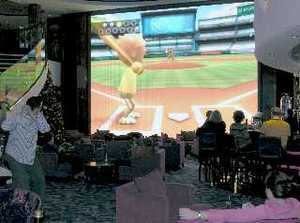 The amazing Nintendo Wii games on a two-deck jumbo screen in the ship's lobby, right, where passengers may play baseball or other virtual games of skill -- with an audience. An indoor color scheme bolder than Gem's sisters -- Norwegian's Star, Dawn, Jewel, Jade and Pearl. The layout, including 10 restaurants and dining rooms, 11 bars and lounges, and the striking bowling alley/bar known as the Bliss Ultra Lounge. Read about Bliss and the Norwegian Pearl. And like the Pearl, which is cruising out of Miami this winter, the Gem has transformed the traditional top-deck, aft-end buffet café into a gleaming casual restaurant where chefs cook the food to order at action stations, and even the scrambled eggs are placed in a serving dish.